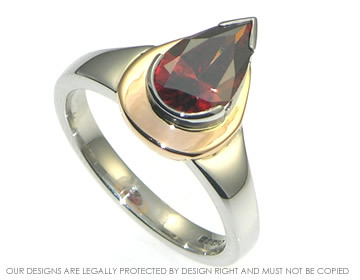 This dramatic and very unusual platinum and rose gold engagement ring design was inspired by a candle flame and the way that a flame splits into different colours. 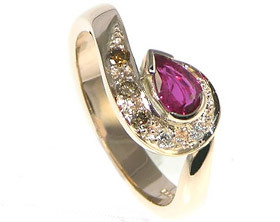 The 1.40cts pear shaped red heat-treated diamond sparkles wonderfully with flamey red, cognac and burgundy flashes. . 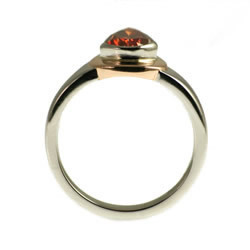 The diamond uses state of the art treatment technology - a naturally cognac coloured diamond has undergone a form of ion induction colour treatment that substantially enhances the colour of the diamond and this actually changes the surface layer of diamond.The treatment means that the ring must not be heated up to very high temperatures (eg by a jeweller during resizing of the ring) or cleaned in an ultrasonic cleaner so special care needs to be taken when resizing this ring in the future and the stone must be carefully removed and re-set during any future resizing work. 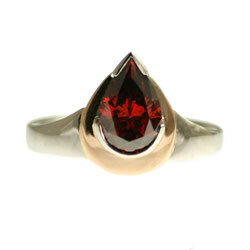 Harriet has set this stunning red heat-treated diamond in platinum and 18ct rose gold.She loves the fire and life in this beautiful heat-treated diamond and thought it would look wonderful against the icy blue-white of platinum.The warmth of the 18ct rose gold refelcts some of the warm orange tones from the heat-treated diamond.The inspiration is stylised with some Art Deco influences so that the form works perfectly as it is, and is only enhanced by knowing the source of the inspiration.The ring measures just over 12mm at the front and is just over 2.5mm wide at the back. 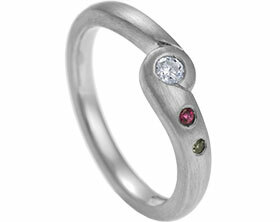 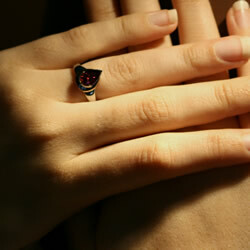 See Michelle's blog article on this engagement ring.